The formation of the NYPD’s new Strategic Response Unit raises disturbing questions about police brutality. When NYPD officers Wenjian Liu and Rafael Ramos were killed last December, I thought the city’s police force would react with violence—more harassment, more arrests, more brutality. Instead, they turned their backs on Mayor Bill de Blasio at both Liu and Ramos’s funerals, and participated in a month-long “work stoppage.” During that time, overall arrests were down 66 percent and summonses for low-level crimes were down 94 percent, as they were only making arrests “when they [had] to.” Some observers, myself included, welcomed the work stoppage, as cops were essentially putting an end to “broken windows”–style policing, which disproportionately targets black, Latino and poor citizens, arresting them for “quality of life” offenses that are nonviolent and saddling them with court fees and fines. Broken-windows policing generally leads to more day-to-day harassment and abuse. But apparently, the violent reaction was saved for the city’s top cop. Police Commissioner William Bratton, the architect of broken-windows policing, announced last week that the NYPD would be forming a new unit, the Strategic Response Group, that would be “designed for dealing with events like our recent protests or incidents like Mumbai or what just happened in Paris.” In his initial remarks, Bratton said this unit would feature 300 to 350 heavily armed officers tasked with combating the threat of terrorism and handling protests. This week, he acknowledged that protests and terror attacks don’t necessarily merit the same response, and said those situations would be handled by two different units. 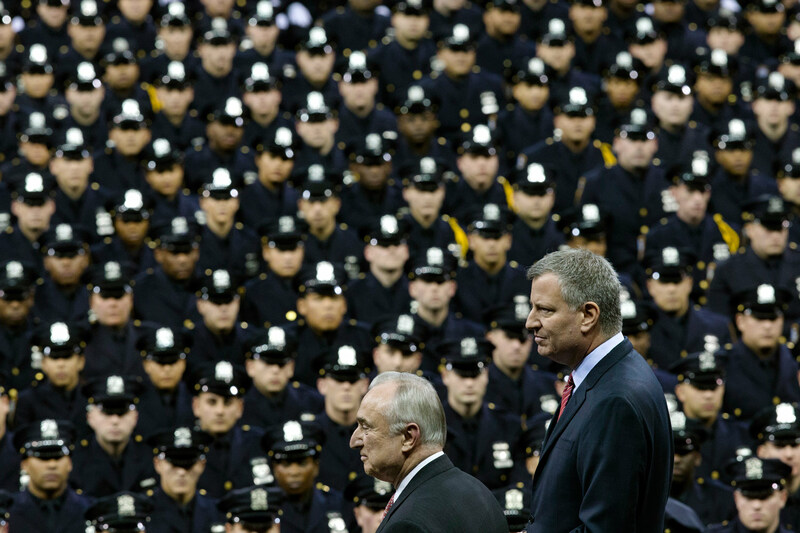 With these proposals, Bratton appears to be trying to take the police state to a new level. Is he not content with a city that extracts revenue for its budget from mass arrests, summonses, and fines? Doesn’t look like it. It seems he would also like for the police to operate with unquestioned authority. It doesn”t seem like special units for counterterrorism and protests would offer any greater degree of harassment and violence to Arab and black communities than already exists, just more specialized and with bigger weapons. But upgrading resisting arrest to a felony gives the police an opportunity to not only be seen as more justified in their use of force when they claim a citizen is resisting arrest but to use the threat of a resisting-arrest charge to make anyone and everyone compliant with any and every directive they issue. There will be little room left to challenge officers (next to none exists as it stands). With resisting arrest left up to the discretion of each individual officer, we could witness entire swaths of the city (I’ll let you guess which ones) turned into land harboring felons. De Blasio remains committed to both keeping Bratton in as commissioner and sticking to the rhetoric of police reform. If he can’t see that the “reform” Bratton has in mind is a power grab for the police that amounts to a threat to democracy, he’s putting the city at risk of a takeover.